This is a quick-n-dirty port of code I had running in another python interpreter on the App Store. The first bit (decompression) is easy - it's just late and I need some sleep. I'm using the simple Shell gist that was pasted in here elsewhere for the time being, but I'm also in the process of porting over my personal bash-alike module which includes things like: unzip, untar, wget, environment variables, tilde/home directory, single vs. double-quote escaping, glob patterns using *? characters, etc. .. The second bit is the hard bit - there's no rhyme or reason to how a particular package unpacks and installs itself. You just have to hope for the sane ones. We can't really run the included "setup.py install" scripts because they'll fall on their face in iOS. The best I'll be able to do is attempt some basic smarts - and otherwise warn the user they'll have to work with the downloaded results manually. Maybe I can include a list of cheats for unpacking popular modules to assist with it. <b>Disclaimer:</b> This works in combination with a (free) third-party App Store app. Using the gist downloader or manually saving it into Pythonista, it should be named 'YoutubeDL' when looking at your list of scripts in the Pythonista interface. The app that this script works in combination with is called 'iDownloads PLUS - Download Manager! ', free, from Amad Marwat, in the iOS app store. Browse to http://m.youtube.com in Mobile Safari, view a video that you like (press Stop if it starts playing, you need to be looking at the page - not the video actually playing), then click on "Bookmarks" and select the bookmarklet that you created. This will launch my script, which will pull the URL of the page you were looking at as an argument, parse it, figure out the direct download URL for the .mp4 video file, then open iDownloads directly to that URL to start downloading it. I picked iDownloads because it's free, can download in the background (up to 10 minutes, with notifications when complete), can download multiple files, can play the .mp4 files directly, has HTTP sharing and iTunes documents capabilities (for getting the video to a computer), can save .mp4 files to your Photo roll, and also has 'Open In...' capabilities to move them to another app. When the download opens in iDownloads, it'll prompt with a few options - I usually choose 'Download As' and then give it a whatever.mp4 video file name. There's some tweaks, if you look at the source code of the script, where you can change what your preferred default download type / quality is (flv, mp4, webm, 720p, 480p, etc.). Apple has continued to crack down on App Store authors that make video download utilities and disallow submission / updates for apps that provide the ability to download content from YouTube and save it to your device. Every app that ever offered this feature (free or paid for) has always eventually removed it claiming 'compliance with YouTube Terms of Service', but it's always been Apple twisting the wrist. I use it in combination with a few other tools that I have so that, without accessing a computer, in my house I can download a YouTube video and then save it to a Samba / SMB file share on the network - making it instantly available to my TVs (WiiMC and XBMC on an AppleTV). Makes it a breeze to download stuff for my 3 year old without having to find the laptop. I've run into some bugs in Pythonista that I'm currently working on workarounds. You can install it and use it fine, as is, for the things that 1.0 did. Added the ability when using the pypi_install( ... ) method to automatically handle zip, .tgz, .tar.gz, and .tar files, decompress them in a temporary location, and locate the setup.py file necessary to configure the module installation. This is supposed to execute the 'setup.py' python script in a separate global and local environment from the existing parent one - storing newly created global variables in 'g' and newly created local variables in 'l'. However, any 'setup.py' script that gets run through there by disutils.core.run_setup( ) invariably breaks the first time it imports something and tries to reference it. Two good examples are the setup.py from 'versiontools' and from 'greenlet' (both are just test modules, not expecting them to function correctly when installed in Pythonista - well, not greenlet anyways). If you download and look at the source of each of these modules, the setup.py files in these instances are just running simple imports (and in the case of greenlet, it's attempting to import glob - a module that's standard in python) and then attempting to access the imported modules. Something <b>weird</b> is happening to exec where it's shoving these modules somewhere unexpected, but I'll keep working on it. Something about the interaction between Pythonista and the distutils it comes with is causing this issue. Just thought I'd fill everyone in on the details in the meantime. The app that this script works in combination with is called 'iDownloads PLUS - Download Manager! ', free, from Amad Marwat, in the iOS app store. I am not affiliated with him, it's just free and very useful (can download in the background with notifications when complete, can download multiple files, can play .mp3 files directly, has HTTP sharing and iTunes documents capabilities for transfer to a computer, and also has 'Open in ...' capabilities to move them to another app). Unfortunately for this script, Mobile Safari cannot directly be used as it lacks an 'Open in ...' capability to move .mp3 files to other apps. 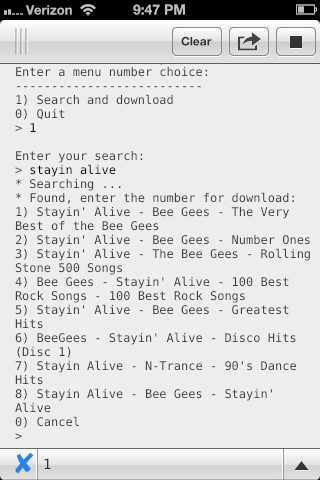 <b>This script is a Grooveshark search + download tool.</b> It allows you to enter what you're looking for, gives you the top 8 results, then helps you download the .mp3. All of these things should help to make sure that you don't get banned. 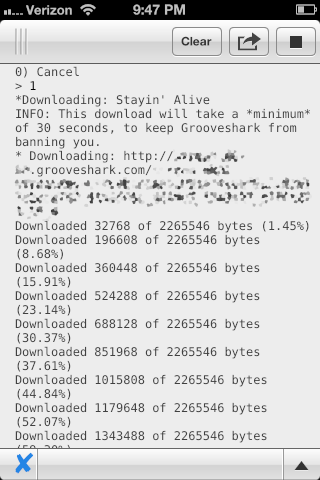 Note: If you do get banned (downloading too many songs too quickly), the ban should lift in 10 minutes or so - try again later. <b>I have no clue if this script will work outside of the US.</b> They're very geographically picky about who can use their site. <li>Once loaded, it will present a menu. Right now there is just a single choice '1) Search and download' (I'll add some more later). 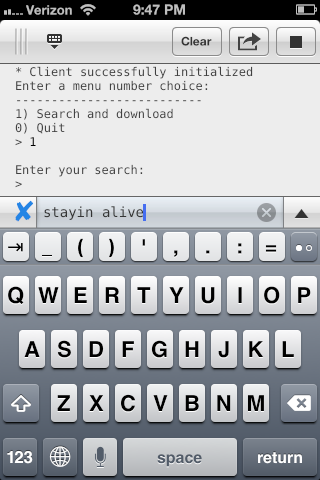 Enter 1, then enter your search term (like the name of a song). <li>It will lookup your entry and provide the top hits (up to 8) for a match. Enter the number of the match you want to download. <li>The download will then start, with progress indicators. As noted, the download will take a minimum of 30 seconds to help ensure you're not banned. <li>When complete, iDownloads+ will automatically launch (make sure you have it installed). <b>You can just hit the 'Download'</b> button as I've configured the script to attempt to offer a decent name for the .mp3. When the transfer is complete (it will be quick), you can go back to the script. It will automatically clean up and offer to run again. I've already got the mechanics figured out for downloading playlists, just wanted to get the initial version published and out there for others to try. @gdcs - Unfortunately, the python Oracle client cx_Oracle includes libraries as it's closed source. Python modules that load external libraries aren't allowed in iOS - they'd have to be compiled into Pythonista as a static whole (which isn't possible for Oracle's client as they don't provide the source). There's no pure python client for Oracle and likely never will be. Even wonderful third-party toolsets like SQLalchemy still rely on cx_Oracle underneath to do the actual communication to the Oracle database servers. @omz - I've used the http server + app method for a couple of my scripts in here (Mega client, for one). This script contains a variant of SimpleHTTPServer I've been developing that has sane timeouts, limited number of responses, etc. (instead of .serve_forever). Side request: please include a newer requests module in the next release - it's gone through some major changes that are useful. @eliskan - Well, I've done Youtube, Soundcloud, Mega, and Grooveshark. They've all been fun. Got another suggestion? Side note: .mp3 files are stored temporarily in the gs_dl folder that it creates. If something goes wrong with the script, you can delete the folder in the Pythonista interface and it'll clear out everything that's in there (whether it's shown or not).